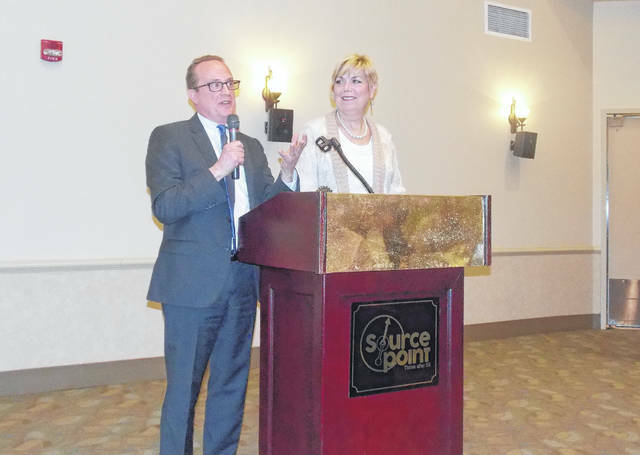 Delaware City Manager R. Thomas Homan, left, addresses the crowd that turned out at SourcePoint on Thursday to hear Homan and Mayor Carolyn Kay Riggle, right, give the annual “State of the City” presentation. Whether it’s former residents moving back home or individuals deciding to move to town based on the ever-growing list of accolades recognizing the City of Delaware as one of the top places in the country to call home, people want to become Delawareans, and the growing population numbers prove it. “We are looking at a population close to 50,000 by 2030, and that’s not too many years away,” he said. “One task City Council is going to have going forward this year is thinking about the growth of the city and how big do we want to become. While Homan touched upon the need to plan for the expected growth of approximately 10,000 additional residents over the next decade, Mayor Carolyn Kay Riggle added the community must continue to work together to keep the city a thriving place where individuals want to live and parents want to raise their families. Riggle said while she receives a lot of the compliments in regard to how great the city and downtown are, she continues to assure people the credit doesn’t go to her, but to the efforts of the entire community: city staff, county commissioners (assist the city on projects like the Sawmill Parkway extension), Main Street Delaware (success of the downtown area), and the businesses that choose to set up shop in Delaware. “It’s our whole community that makes our city what we are today, and I’m so proud to be part of it and to be the face of Delaware,” she added. Both Homan and Riggle noted the city also benefits from its location within ever-growing Delaware County and central Ohio. In order to accommodate the growth expected within the city over the next decade, the “State of the City” address revealed that the focus this year will center on a new version of the city’s comprehensive plan as well as infrastructure improvements related to transportation. Homan said the time has come for the city to update its comprehensive plan, which will take anywhere from 18 to 24 months to complete. As for addressing transportation infrastructure, Homan noted no conversation concerning the city is complete without the mention of one issue in particular — The Point (bottleneck at the U.S. Route 36/State Route 37 intersection). The good news, he said, is the city has signed a contract with an engineering firm and continues to work toward securing additional funding to pay for the city’s remaining $6 million share of the $25 million project that will replace the railroad bridge at The Point with a new one that will allow for two lanes of traffic to pass under it in both directions. The current project outline shows 2023 as the anticipated completion date. “Hopefully, all of us will still be here at the ribbon cutting,” Homan said. In a related matter, Homan stated the East William Street Improvement Project will kick off in the coming months with the removal of trees along the roadway to allow for construction to take place in 2019. In addition to creating a continuous center turn lane, the project will include the installation of a new pedestrian bridge — double the length of the current one that spans East William Street near Lake Street — to allow for the intersection to be widened. • Construction of Fire Station 304 at the northwest corner of the Cheshire Road/Glenn Parkway roundabout. • Infrastructure improvements to serve the city’s growing southeast quadrant. • A discussion centered around establishing a dedicated revenue stream for transportation-related infrastructure. • The opportunity to continue developing the city’s Sister City Program which currently involves relationships with Baumholder, Germany, and Sakata, Japan.